Amidst the present buying /Christmas menu -planning / card writing /etc etc I am playing with wool and felt and threads and fabric. You have to have balance, after all! Spring Blossoms, Summer Holiday, Autumn Woodland, Winter Solstice. I had a rough idea which colours would match each season - poor old Winter Solstice remains a tad boring being merely reds and greens, but there you are. Then I thought I needed to expand upon this because I made a bangle in greys to go with my "Fifty Shades" outfit (I do wear a lot of grey, 'tis true.) And I wear a lot of blue so I wanted bangles in blue shades.... so I combined them and came up with Blue Lakes and Rocky Shores (I bet all you Girl Guides are singing along now, aren't you?) Then my gaze fell upon a particularly scrumptious hand-dyed wool-felt in purples/greens and I thought Heath and Moorland might be another nice colour way. Excuse the poor colour, the light is bad, I'm a poor photographer and my camera also is very selective when it comes to accurate shade depiction. Also, I need to say that of course I will dip into other colours which pop up which seem to belong in a particular scheme; only I had about reached my toleration limit for faffing about sorting these out for you! Then I was reading the deliciously colourful eye-candy blog Attic 24 and was gripped by Lucy's latest crochet project in her signature saturated colours and knew I had to make a bangle to match. The best match I could come up with in my colours was Summer Holiday, where I can indulge in all my brights, but somehow it begged to be called Carnival when I had made it. I can't tell you how satisfying this one was to make. 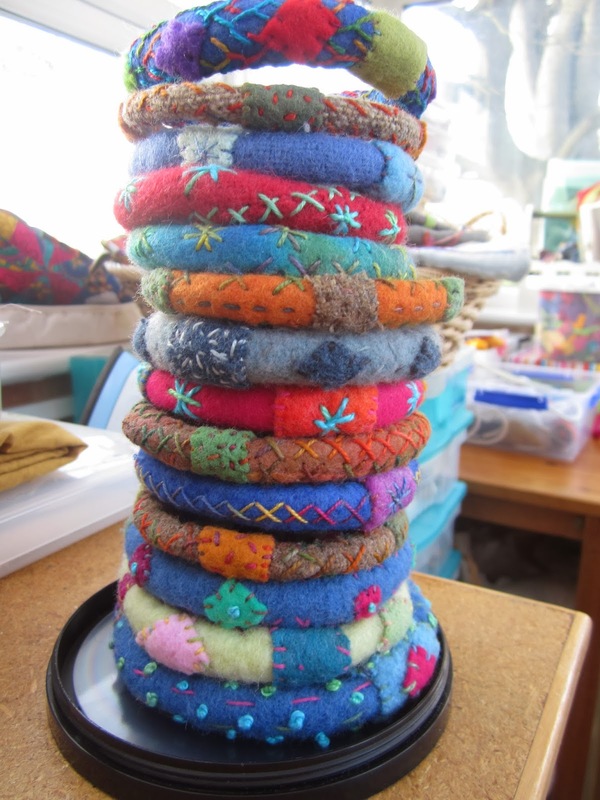 The wool felt is gorgeous - from Jean at Oliver Twists, really soft and wonderful to stitch. The perle 5 thread is 'confetti' from Weeks Dye works, and is an overdyed fibre which just SHOUTS carnival to me! I think now I have dug a hole for myself - perhaps I should abandon the idea of colour schemes and just make bangles as the fancy takes me. But then, I do like the idea of being able to just gather felts/threads in specific colours when I start to work without all the deliberation each time. It is helpful. And to be honest, I just like giving things names. I love playing with words. What do you think? And what, apart from festive concerns, has been taxing your mind at the moment? Have you any spare time or mental capacity for anything else? See you soon -ish! I love them all and your names too! To me Winter Solstice might be in ice blue/white and silver shades as well as red and green. Just make them as the fancy takes you I'd say and then name them afterwards why be tied to all the same colours every time?!! Your bangles look so artistic and the color schemes are fantastic. Sometimes it can get overwelming to deal with so many colors butyou've done a good job. Hello Kelly, thanks for visiting! Yes, I think this helps with organising my thoughts when I start a new bangle. What a happy array of gorgeous colors and textures. I think your naming things is lovely and expressive. I finished the star-shaped batik table topper yesterday, wrapped it and immediately mailed it to my daughter in California so it would get there before Christmas. I completely forgot to get a photo of it. A senior moment. Good Morning Lynne, As always, I am amazed at your needle work. You must have people asking about your bangles everywhere you go. They are so stunning. Your color schemes and layout photos are awesome. They look like a professional design studio layout and the names are grand. I think giving them names is quite unique and adds a little more whimsey to these fun accessories. It also shows your fun loving personality . . . great post! Keep smiling and have a fabulous Christmas. Just to wish you and the fisherman a Merry Christmas and all the best for 2014. I have enjoyed reading your blog, enjoyed being inspired by your creations and made one of my own. I look forward to more of the same in 2014, though as arthritis is now a problem in my hands, sadly there will have to be a lot less making and creating.